Mijung, Korean. Viana, Spain. April 26th, 2011., originally uploaded by Hannah is a Palindrome. WHERE: Albergue de Peregrinos, Viana, Navarra, Spain. SLEEPING PATTERN: Collapsing on her bunk after hours of walking, Mijung passed out before she made it to the shower part of the daily routine. MIJUNG appreciates simple things like juicy oranges and Spanish chorizo. She explained to me the practice in Korea of using blood types to categorise personality traits and in return I was a good english teacher to her (so she says). One of the blood types is said to be either a genius or a psychopath. Not knowing my blood type (an ignorance that amazed the Koreans) I joked that I must be that one. She assured me that I was a genius. Her motivation for coming on the Camino was to pray to find a husband, having recently turned 30. Interestingly, Mijung is not actually baptised, but does practise prayer to a Christian God. On the Camino she attending mass for the first time. Along with her unconventional relationship with religion, she also blew my mind a little with the importance and urgency she places on marriage, as it's something I personally struggle to understand. After frankly professing her quest, she went on to develop a little crush on Francois. So, of course, Eugene and I incessantly teased them both about their impending marriage. Mijung made me this folded note as a parting gift while we drank a cervesa together one afternoon when I couldn't walk on anymore. She wrote the letter in Korean, cheekily leaving me with the task of finding someone to translate it. When I did find another Korean pilgrim, days down the track, the words Mijung had to say to me were very sweet and heartfelt. If you've read the PISW zines, you'll know that I collect some souvenir or memento to remind me of each person. 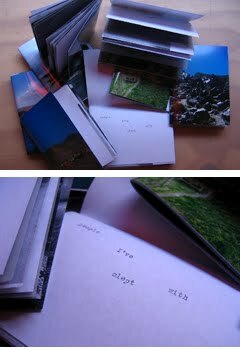 Photographs of these are included in the zines. This is the first time I have a memento documented on video!